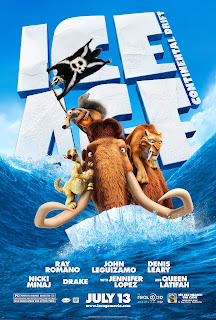 Ingredients: If you liked the animation of Ice Age, the characters of Ice Age: The Meltdown, and the comedy of Ice Age: Dawn of the Dinosaurs, then you will like this movie. Obviously. Since I’m a young, happening bachelor with no kids, I had to bring my inner child with me to this one. And, while he thought driving and buying ice cream whenever he wanted was amazing, even he wasn’t that excited about seeing Ice Age: Continental Drift. When Scrat -- the primitive fanged squirrel always trying to find an acorn -- bounces around the core of the Earth, the tectonic plates begin to shift and break up the worlds first and greatest landmass into several pieces. Manny the mammoth (voiced by Ray Romano), Diego the saber-toothed tiger (voiced by Denis Leary) and Sid the sloth (voiced by John Leguizamo) are separated from their families during the continental split and have to navigate rough waters to get back to them. Along the way, the trio is attacked by a group of savage pirates led by Captain Gutt (voiced by Peter Dinklage.) The group has to fight off the pirate scourge as they try to find a way home, all the while, a slow moving land mass threatens to smash everything in its path. The biggest flaw in the movie is that it feels like it was split in half. On one side you have the original characters from Ice Age on an exciting seaworthy journey with a few Pirates of the Caribbean-esque moments in between while on the other side you have mundane teenage melodrama that amounts to very little other then wasting time and brings absolutely nothing new to the table. And I’m not really sure why they chose to go with Peter Dinklage as the voice of Captain Gutt. Dinklage’s voice isn’t all that distinctive and he’s not experienced as a voice actor. It sort of sounded like he didn’t know what voice to portray so he tried a little of everything. I can’t help but think Dinklage was given the part because of his popularity; his well deserved popularity. But that’s part of an annoying trend I’ve noticed in most big Hollywood animated films. High profile actors will often be cast for every voice role regardless if they are a good fit or not and at times that can hold a movie back. I’ve never been a big Ray Romano fan but he was a great choice for Manny the mammoth. Same goes with John Leguizamo as Sid. But I’m still not convinced Denis Leary was the best choice for Diego. Coincidentally, Denis Leary has now been playing a CGI saber-toothed tiger for a little over half his career. Who saw that coming? I really liked the first Ice Age. For some reason, probably the sequels, the original Ice Age has been swept under the rug as some bland, everyday kids flick but really it was incredibly interesting. Taking place in a bleak setting with diverse, well developed characters and involving really deep, challenging subject matter. It was just great. And a quick side note, where are the humans! The first Ice Age was all about Manny getting over his anger at mankind to return a lost child back to its tribe. But in all the sequels you never even get a glimpse at anything relating to humans. What, did they all die off? That’s a pretty big historical plot hole, isn’t it?? But back on topic. It really is a shame that the Ice Age franchise has lost some of its more melancholy insightfulness in exchange for lazier humor. Overall, Ice Age: Continental Drift does, at least, have something for everyone. Parents can appreciate the good voice-acting and decent plot. Scrat has some good traditional slapstick zaniness for the really little kids. And the high-seas adventure will excite the slightly older children. And I guess the Teen-Disney moments could appeal to the teenage crowd. Although, if they’re anything like me they might end up questioning just what is the hierarchal social structure of a Cenozoic era pachyderm society. Or who they’re going to ask out to the school dance!